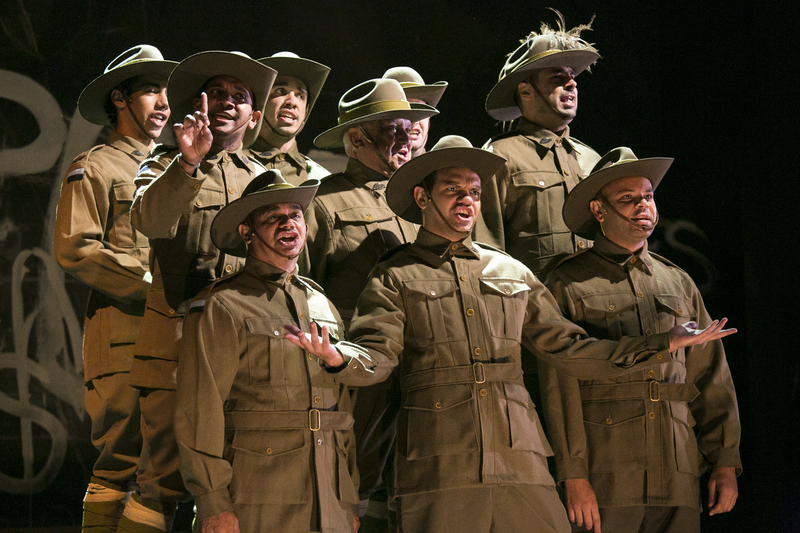 The words “Lest We Forget” are movingly evoked at the end of Black Diggers but, in fact, this new Australian play is more about illuminating a little known part of Australian history – the role and treatment of around 800 Aboriginal diggers during World War I.
Sydney Festival is presenting the premiere of this important Queensland Theatre Company production written by Tom Wright and directed by Wesley Enoch to coincide with the centenary of the start of the Great War. Drawing on verbatim and other source material held by the Australian War Memorial, with research by David Williams, Wright has created a script full of short scenes and little vignettes, punctuated by song, which come together powerfully to offer a shocking and moving insight into the subject. We see why Aboriginal men joined up to serve a King and country that didn’t even class them as citizens, the camaraderie and friendships they forged with other Australian diggers in the trenches and on the battlefields where colour became irrelevant, and their dashed expectations as they returned home having enjoyed an equality they hadn’t previously known, only to find that nothing had changed in Australia. Worse, many found that their own lands were taken away from them and given to other returned servicemen as part of the Soldier Settlement Scheme, which Indigenous soldiers were ineligible to apply to. On top of that, many were ostracised by their own communities. And, of course, many suffered post-traumatic stress disorder. Enoch directs all this with a light touch, balancing the dark moments with a genial, knockabout humour, though never shying away from the tough themes. The all-male Indigenous cast play a wide range of characters, black and white, and do a terrific job of delineating them all, sometimes in very brief cameos. Featuring George Bostock, Luke Carroll, David Page, Hunter Page-Lochard, Guy Simon, Colin Smith, Eliah Watego, Tibian Wyles and Meyne Wyatt, some of the cast are more assured as performers than others but they work together as a strong ensemble and all deserve praise. Stephen Curtis’s clever set (dramatically lit by Ben Hughes) works on both a practical and metaphorical level. Black walls frame a black stage with a raised central platform and a fire in an oil drum to one side. As the play progresses, the names and dates of soldiers and the battles they fought in are chalked on the walls until they have become covered in white – symbolic of the whitewashing of the Indigenous diggers’ role in our history. Finally, having filled in this gap in our knowledge, the cast wipe away some of the white to spell out the words “Lest We Forget”. Running around 100-minutes without interval, Black Diggers is a compelling piece of theatre. It tells an important story but does so without hectoring or lecturing, moving us instead to laughter and tears. It deserves to be seen widely. This entry was posted in Theatre and tagged Ben Hughes, Colin Smith, David Page, David Williams, Eliah Watego, George Bostock, Guy Simon, Hunter Page-Lochard, Luke Carroll, Meyne Wyatt, Queensland Theatre Company, Stephen Curtis, Sydney Festival, Tibian Whyles, Tom Wright, Wesley Enoch by jolitson. Bookmark the permalink.